Martin Jonas. Book Comedian Martin Jonas. Martin Jonas, discovered at South Africa’s first real comedy club, Hysterix in Johannesburg, has impressed audiences with his novel style and pertinent observational humour. 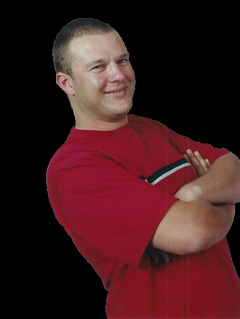 Martin Jonas is South African to his fingertips and was one of the few performers to receive a standing ovation at the inaugural Smirnoff Mule comedy Festival at the Baxter Theatre in Cape Town in 1997.
intelligence to his dialogue that leaves you feeling that Martin Jonas is destined for big things. Martin Jonas’s brand of comedy can best be described as observational, from where Martin Jonas has been known to wonder off into some very surreal territory. Martin Jonas has always pursued live entertainment and Stand-Up is the most direct route to connecting with an audience, and a live audience will always let Martin Jonas know when something is really funny. Martin Jonas impersonations of famous people are also a treat. My guess is that if there had been a contest to impersonate ex-President Nelson Mandela, Madiba himself would come second to Martin Jonas. Martin Jonas’s novel style and insane observations about life in South Africa has comedy fans screaming for more. Delivered in English, Afrikaans, Tswana, Sotho and a smattering of Zulu, Martin Jonas appeals to audiences across the board. As a clever and topical comedian, Martin Jonas’s a firm favourite in the corporate market as both entertainer and as an MC. To liven up a dull crowd, you just can’t do better than the down to earth Martin Jonas.